Appalachian Winter come from the snowy mountains of Pennsylvania of USA. They are the solo band of Danny George Klyne, formed in 2007. He has self-released two albums so far, “Silence Before the Great Mountain Wind” in 2008 and “Winter Eternal” in 2009. Both albums are actually demos, but they are full-length releases and both come with full artwork. Their music is epic black metal with symphonic and folk elements. “Winter Eternal” has 9 very well composed songs, lasting about 46 minutes. They definitely have a personal sound, with a big variety in their music: epic mid-tempo black metal songs, enriched by synths and acoustic instruments. There are many changes during the songs, where cold black metal, tranquil acoustic parts, extreme melodic metal and epic majestic parts are combined in absolute balance. He uses both brutal and epic clean vocals in a very interesting dialogue between them. Even if his clean vocals are completely correct and in-tune, at some parts when he sings in “deep” operatic style they sound somehow “fake” (I can’t find the correct word in English), but this is just details… The production is ok for a demo, but the symphonic nature of Appalachian Winter’s music requires a much clearer and powerful sound that will allow these great songs to be properly presented. Lyrics deal with nature (especially the surrounding environment of Pennsylvanian mountains) and a bigger preference in winter related themes. 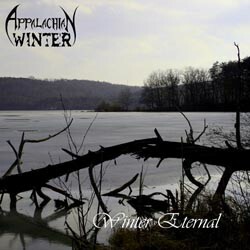 Summing up, Appalachian Winter is a very interesting band from a really talented man, who seems able to compose great melodic black metal songs and is very skillful in many different instruments. He already composes his third album. The only thing I’d like to see from this band in the future is a more professional production and a little improvement in the clean vocals. You can visit their official pages to download both albums for free! You can also get the albums directly from Danny in pro-printed CD-r versions with great artwork.